Your teeth and gums have a highly sensitive network of nerves. But while it can signal even the most subtle discomfort we may not be able to identify the cause with pinpoint accuracy. 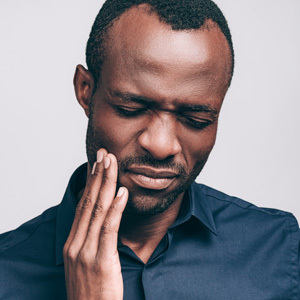 As a result, tooth pain could indicate more than one kind of problem including a decayed tooth, root sensitivity, infected gum tissues (like an abscess) or a dying pulp signaled by diseased nerve tissue inside the tooth. On the other hand, not all tooth pain is the same: it can be dull or sharp, continuous or intermittent. It can feel like a constant, throbbing ache or a sharp wince when you eat or drink something cold or hot, or when you bite down. These differences could point our diagnostic examination in the right direction. For example, sharp, throbbing pain could indicate deep tooth decay, especially if it suddenly stops. That would likely mean the nerves within the tooth pulp under attack by the infection have died and can no longer transmit pain. The infection, on the other hand is still very much active — this usually requires a root canal treatment (cleaning out the pulp and root canals of diseased and dead tissue and filling the empty spaces) if we’re to save the tooth. If, however, you’re experiencing sensitivity from temperature or pressure, we could be facing at least a couple of scenarios. For one, your tooth could be fractured. More likely, though, periodontal (gum) disease triggered by bacterial plaque has caused the gum tissues to shrink back (recede) from the affected teeth so that the sensitive dentin layer is exposed and no longer protected by the gum tissue. If we diagnose gum disease, we’ll need to aggressively remove bacterial plaque from all tooth and gum surfaces. This procedure might require more than one appointment and the possibility of surgery if we encounter deep pockets of infection, especially around the roots. If gum recession is severe you may also need grafting surgery to replace the missing gum tissue or to re-cover the exposed areas of your teeth. So, knowing the source of tooth pain will direct the course of treatment to follow. With proper treatment, though, the chances are good we can not only restore your teeth and gums to optimum health but we can end the pain.